The Chiprovtsi Monastery is an orthodox monastery in the valley of River Ogosta in Bulgaria. The history of this monastery is quite sad. It was established in the 10th century and was very active till the raids in the 13th century. Following this was the Ottoman invasion of the 14th century, and raids again in the 16th. With the monastery being raided multiple times it came close to being in ruins. The monastery that we see today is the structure built in 1829. It is dedicated to Saint John of Rila. 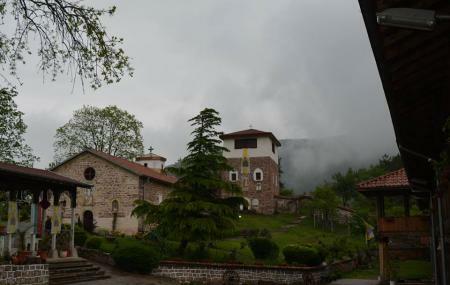 Use Bistrilitsa trip planner to visit Chiprovski Manastir "sveti Ivan Rilski" and many others to your visit. You won't miss your home when in Bistrilitsa, hotels in Bistrilitsa like Suhin Dol Hotel, Hotel Vodenitsata, Kyshta Za Gosti Chiflika and Family Hotel Salvia offer some of the best places to stay in the city. Create your own Bistrilitsa vacation packages or choose from the ones made by travel experts. Also explore the best ways for how to reach Bistrilitsa. Love this? Explore the entire list of places to visit in Bistrilitsa before you plan your trip. Fancy a good night's sleep after a tiring day? Check out where to stay in Bistrilitsa and book an accommodation of your choice. Peacefull and really nice place. The Chiprovski monastery "St Ivan Rilski" is in the Northwestern part of Bulgaria. You need to drive about 7 km to northeast of the town of Chirprovtsi to view its buildings. Actually the cloister is at 29 km on the west of the regional center, the town of Montana. It was founded in the beginning of the X-th century and it is one of the thirty monasteries from the First Bulgarian Kingdom and approved in the country the mission of Kiril and Metodi brothers who are the fathers of the Slavic Alphabet. One of the most important monasteries from the Bulgarian Renaissance. Nested in the mountains it's an ideal place for relaxation and recharge. Historic place. And last but not least there are bones from St. Ivan Rilski where you can place your hand and draw energy and heeling power. Take some picnic for a great lunch up the hill. Nice monastery but unfortunately under reconstruction when I visited it.